An additional objective intricately linked to peregrine falcon conservation efforts is that of monitoring the annual movements and the fate of birds fledged and/or hacked in Virginia. VDGIF has begun addressing this through a FalconTrak partnership with CCB, NPS, USFWS and the National Aeronautics and Space Administration (NASA). 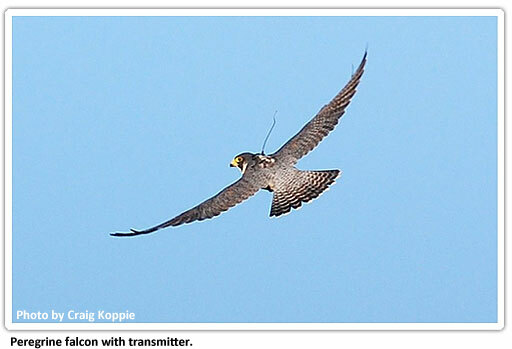 Launched in 2001, FalconTrak employed solar-powered transmitters fitted onto peregrine falcon chicks to track their post-fledging movements via satellite. Transmitters were fitted onto 19 chicks originating from coastal sites and from a captive breeder, and fledging at their natal sites or from hack sites in downtown Richmond and in the mountains. Nearly one half of the birds were lost in the first 10 weeks after fledging, mostly as a result of collisions with utility lines and buildings. Surviving birds, including birds hacked in the mountains, dispersed both north and south along the coast. This pattern of movement is probably driven by higher prey availability in coastal areas during the late fall and winter. Many of the birds spent significant periods of time in major cities such as Baltimore, Philadelphia, Trenton, New York City and Boston; barrier islands and extensive marsh complexes were also utilized. Of the 9 surviving individuals, 3 exhibited definitive southerly migration movements. One of these flew to South Carolina, and the other two made transoceanic flights from the Outer Banks of North Carolina. One of these two birds made its way to Miami, and the other eventually ended up in the Dominican Republic. Transmitter hardware malfunctions and software programming were such that only one bird fitted with a transmitter in 2001 was still being tracked in 2002. Additional falcons were fitted with transmitters between 2002 and 2004, and again in 2007 at New River Gorge in West Virginia. The FalconTrak partnership continues to gather information that is essential to our planning for recovery and management of peregrine falcons in Virginia.